Please be Patient – Be with you Shortly! Tomorrow begins Advent in the Church’s calendar. We start anew, marching toward the Light of God. Advent is a time of preparation for the coming of the Light of the World. It is a time of expectation and of waiting. The Church must be half mad really. In a culture that pays highest respect to expediency, and immediate gratification, the Church sets aside a season dedicated to patience, prayer, and expectancy. While every sight and sound around us is declaring, in the loudest possible way, that Christmas has arrived, Advent stand up and says, “Hold on! Wait! Listen! Watch!” This is not a culture that much appreciates the words “Please be patient – I’ll be with you shortly!” Two minutes too long in a Starbucks line is enough to cause petulant rage between customer and his Barista – especially this time of year. It is in this realm that the Church says, let’s be patient and wait. “Wait for the Lord, whose day is near.” As a church we must be half-mad…right? ‘What is growing, and ready to emerge into new life?’ God is at work in you and in me. God is growing light and life. We must consider what God is about to birth in us. This is hard for us to accept at times. All of the commotion and cultural hoopla that we are immersed in, clouds our vision. We are at the same time deafened to the voice that tells us how beloved we are, by the raucous canticle of consumption. We need time to step away from Black Fridays, Christmas office parties, midnight madness, end of term papers, end of year deadlines, and the expectations of many to look, to listen, and to wait. Wait for the birth of something new. Take time this Advent to step back, to sit still and to listen to what is about to emerge in your life. 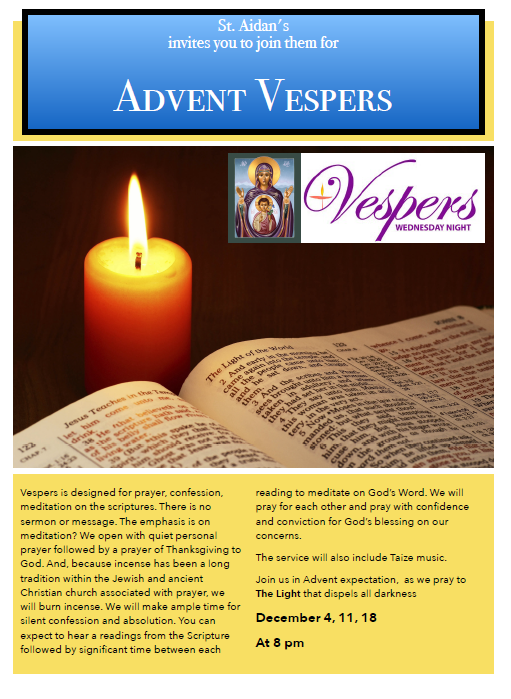 If you are looking for a place to do just that, join us at St. Aidan’s Church on Wednesday evenings at 8 pm for Advent Vespers. Each week allows time for scripture reading, prayer, meditation, and song all designed to give us time to take pause. As an added bonus, there will be no preaching! I hope you can join us. It will give us all an opportunity, as we bring in Christmas, to ask ‘how we will give evidence of love incarnate to the world around us?’ Something great is about to emerge – God is at work – come listen with us as we wait for the Lord. Thank you, Kevin. Your Blog today was like a whistle blown in my ear to say STOP trying to do six things at once. Stop and enjoy the coming Birth of the Infant Jesus and all that it means to us. The baking, shopping and preparations will get done and we will be ready to greet our Blessed One with love in our hearts and smiles on our faces!